Did you know that adults with attractive teeth are perceived as friendlier and more successful by their peers? It’s true -- and damaged teeth can give even the most confident smiles a reason to hesitate. 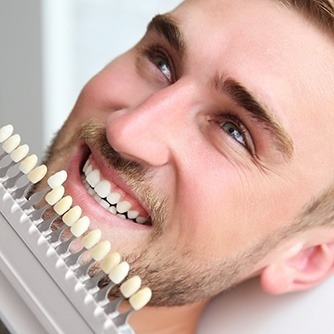 Fortunately, porcelain veneers from Dr. Metzger, your cosmetic dentist in Farmington, can help you rejuvenate your teeth and regain your smile’s confidence with just one procedure! Keep reading for more on this fantastic treatment. Our team of dental experts can mask your chipped, stained, or slightly misaligned front teeth quickly and effectively with porcelain veneers. These thin sheaths of porcelain are securely bonded directly onto the surface of the teeth, instantly restoring or enhancing their shape, size, color, and overall appearance. In just two visits to Monet Aesthetic Dentistry, we can give you the stunning smile you’ve always dreamed about. When you decide that porcelain veneers are the cosmetic treatment you and your smile need, you’ll come into our office for an initial consultation. During this appointment, Dr. Metzger will thoroughly discuss your smile goals with you, and then she’ll consider your facial shape, skin tone, hair coloring, and overall appearance to put together your unique veneer treatment plan. Then, she’ll take detailed notes, X-rays, and impressions for the creation of your beautiful veneers. With the information gathered by Dr. Metzger, a trusted ceramic artist will make your restorations by hand at a cosmetic dentistry lab -- and once your porcelain veneers are ready, Dr. Metzger will check them for shape, color, overall appearance, and fit when she places them onto your teeth. And the result? 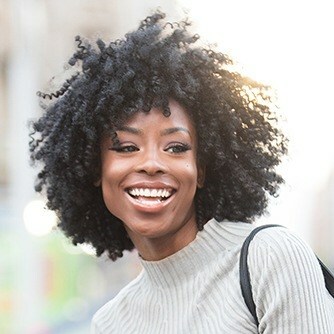 Fabulous -- a beautiful smile that truly reflects your unique style and personality. These are just a few of the benefits you will enjoy -- we can’t wait to see what you’ll add to this list! If you’re interested in seeing what you look like with your very best smile, contact Monet Aesthetic Dentistry and book your appointment to learn more about porcelain veneers (or any one of our other offerings in cosmetic dentistry) today!